A patch is out to get this game to run on modern operating systems! Kudos to "Sir Cabirus"(for the patch) and "Moscow Dragon"(for the solution)! However, it doesn't work fine on my Pentium II Windows XP machine, as claimed, but it may work on yours. DOS emulation! This project is specially done to cater for those DOS games that can't be run in modern operating system. I would say it is 95 % compatible. Check our guide here on configuring DOSBox for Windows XP / Vista / 7. How to run Ultima Underworld I/II in Windows 2000/XP. This was posted in Experts-Exchange with some users reporting successes. This patch is designed to replace the existing music files for Ultima Underworld 2 with new optimised GM files. File obtained from Ultima: The Reconstruction. The text version of Memoires of Cabirus compiled by Joye the Librarian. 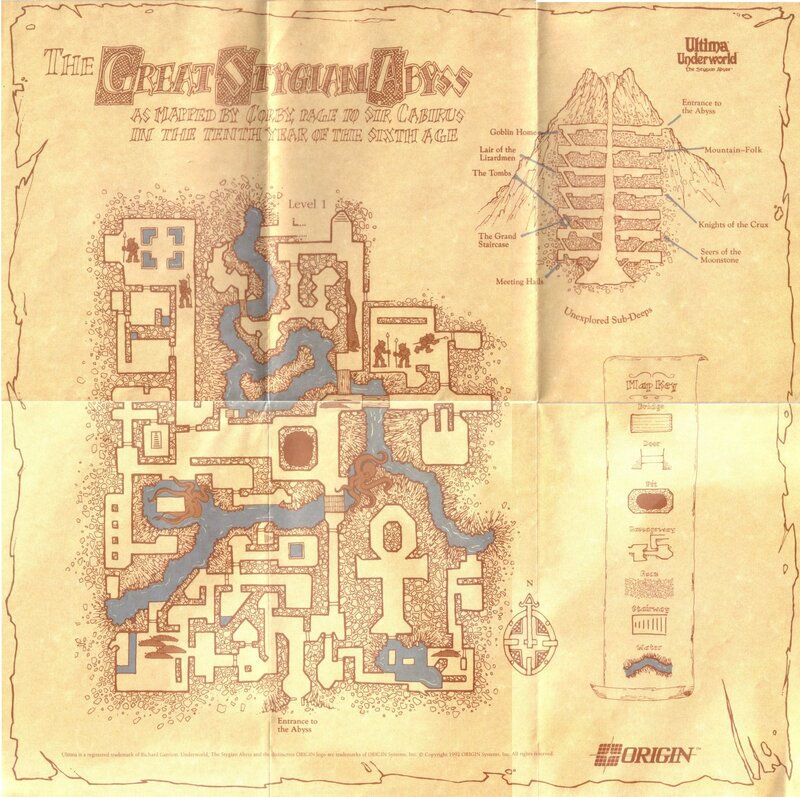 Player's guide user manual that came with Ultima Underworld I: The Stygian Abyss. Spells, skills and how to play the game. Included in the PDF manual below. Here you go - the whole PDF manuals from the Ultima Underworld compilation! Includes Map of Level 1, Reference Card and Player's Guide. Explore the first level, as you solve mysteries and get a sneak peek of why this game made it to the joyful memories of many. Self Extractor. Gigaquad did not like how dark the Underworld games were and wanted to increase the brightness a bit. A well known fact is that deleting data\shades.dat will remove all shades, but this really kills the atmosphere. This gives a more natural brighter light ambience in the game. Corrects the inventory bug in the disk based versions. Not required for the CD versions. Ever wanted to know how to original box looked like? The catchy phrases? Here are the scans of the complete series. Updated 25 Apr 2006. Thanks to VGMuseum. All of the Ultima Underworld I Midi Music is complied in one Zip file! Listen to the peace folk music, Combat theme as you work. Download it Now! A remarkable collection of icons you can use for program shortcuts. These mouse drivers take very little memory. An excellent 3D viewer of the underworld games. Try it now! It's freeware! High resolution scan of the map that came with the game box. 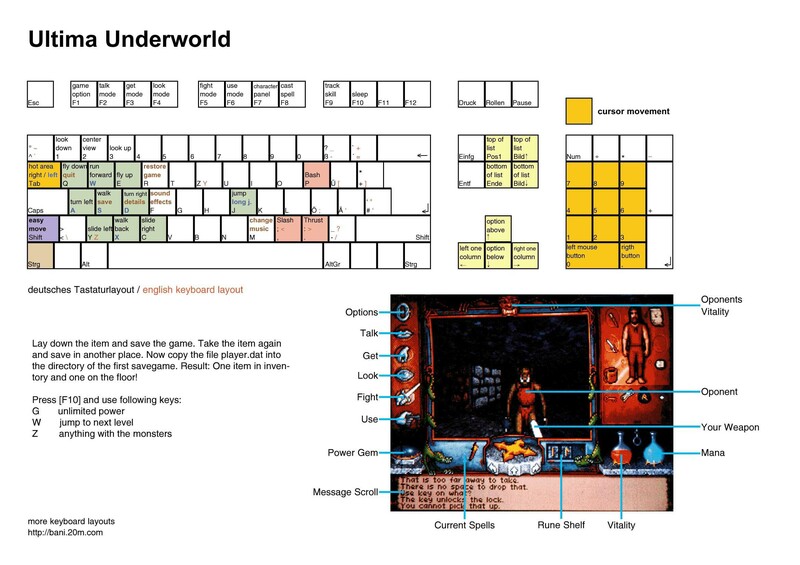 This file tries to collect all file formats and data structures used in the game Ultima Underworld 1. It originated from the "uw-specs.txt" file that was found with "The System Shock Hack Project" (TSSHP). A recreation of the entire first floor of Ultima Underworld for Unreal. Now, you can blow your friends away in the classic depths of the Great Stygian Abyss. The level is fully implemented for all default gaming modes, including darkmatch, and co-op! It also is fully enabled for botmatches, in case your friends are busy. A remake of the entire game of Ultima Underworld for Unreal Tournament. Each map is generally enhanced over the original version, so you can expect your favourite areas from the classic game to have a great new feel to them.